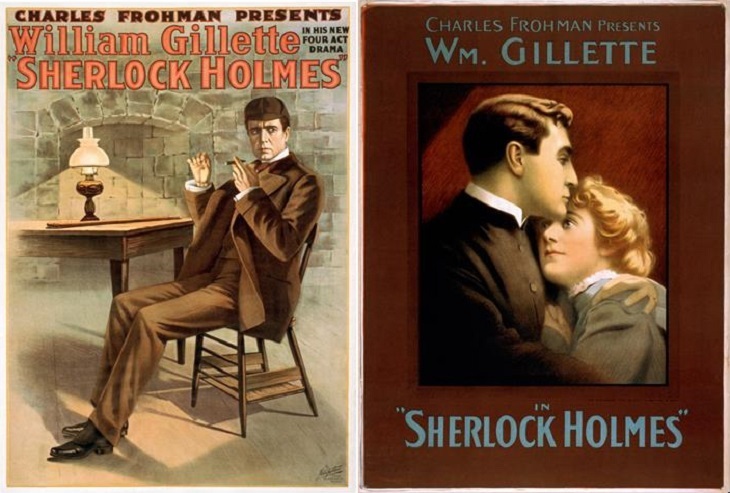 Posters from American William Gillette's early turn as Holmes. On New Year’s Day, one of London’s best-loved residents will be returning to our screens. Snow falling on Baker Street, Victorian dress, hansom cabs on cobblestones… What could be more typically English — or more evocative of London — than a Sherlock Holmes adventure? Except that Benedict Cumberbatch, star of the BBC Sherlock series, is something of a rarity — a London-born actor playing the great detective in a British production. There have been many famous on-screen Sherlocks over the years, but surprisingly few of them have come stamped with ‘made in London’. The first actor to play the part of Sherlock Holmes in an official capacity was actually an American. William Gillette hailed from Connecticut and was already a successful stage actor when he adapted a play begun by Arthur Conan Doyle himself. Gillette donned the deerstalker, introduced a love interest and a curved pipe, and turned the play into a massive hit on both sides of the Atlantic. The curved briar pipe was necessary, it’s said, because a straight pipe obscured the actor’s mouth when he was saying his lines. The early days of film saw a rush of silent Sherlocks, but the first really big star to take on the role was another American, John Barrymore (see below). Although the exterior shots of his Sherlock Holmes were filmed in London, the rest of the production was firmly based in Hollywood. Home-grown Sherlock Holmes films did get made in the 1920s and 30s (Eille Norwood and Arthur Wontner, two little-remembered British actors, were both prolific in the role), but it was not until 1939 that a British actor (albeit one born in South Africa) made the role of Holmes completely his own. For cinema audiences of the 40s, and for many years later, Basil Rathbone became the face of the great detective. 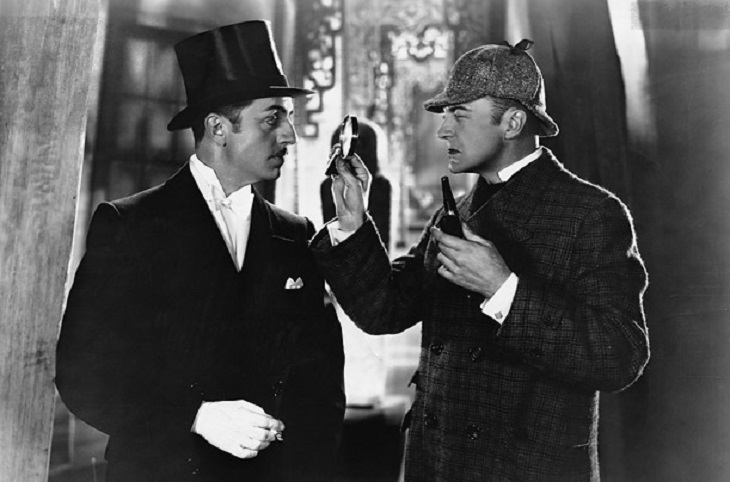 John Barrymore (right) as Sherlock Holmes, with William Powell (left), from 1922. With Nigel Bruce in support as a notably bumbling Watson, it’s easy to remember Rathbone’s films as quintessentially English — fog, top hats, deerstalkers and plenty of tweed — yet all 14 of them were actually made in the US and only two were set in the Victorian period. The remainder had contemporary settings, allowing Holmes to pursue Nazis and to urge the purchase of War Bonds. 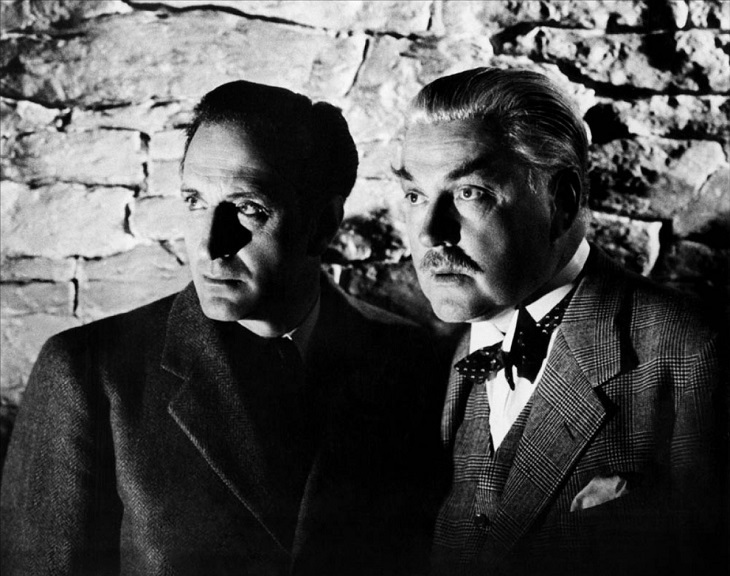 Basil Rathbone and Nigel Bruce in Sherlock Holmes And The Secret Weapon, 1942. It was the BBC who brought Sherlock Holmes back to London. A six-show series in the 1950s was studio-based and broadcast live, with Alan Wheatley in the starring role. But the great detective was abroad again three years later; Ronald Howard was a gloriously English Sherlock, but his series was made for American television and was filmed exclusively in France, with French actors taking some of the minor roles. The tastes of its US audience might explain why one episode features a Texas cowgirl and a Native American chieftain. It wasn’t until 1959 that Sherlock Holmes returned to the big screen, in a very English affair from Hammer Studios, with Kent-born Peter Cushing as Holmes and Christopher Lee as Sir Henry Baskerville. The critics, sadly, were not overly impressed. Christopher Lee, a genuine Londoner, was given his chance to play the great detective three years later — but, alas, in a German production. Holmes and Watson spoke their lines in English and were dubbed later, while the other actors spoke in German. And when the film was dubbed back into English for distribution in the UK, two different actors voiced the leading roles. Crazy. The two most notable Sherlock Holmes films of the 1970s were both directed by Americans — but at least they were made at Pinewood Studios. Billy Wilder (an Austrian-American, to be precise) chose Bristol-born Robert Stephens to star in The Private Life of Sherlock Holmes. And Nicholas Meyer chose a Scot, Nicol Williamson, in The Seven Per Cent Solution, a film shot in part in Vienna. For many people, Basil Rathbone still remained the ultimate Sherlock, but his title was seriously challenged in the 1980s when Jeremy Brett took on the role for the hugely successful — and long-running — Granada TV series. Brett was educated at Eton and studied acting at London’s Central School, but the series itself was made at Granada’s studios in Manchester. The replica Baker Street that was built there proved a popular visitor attraction. 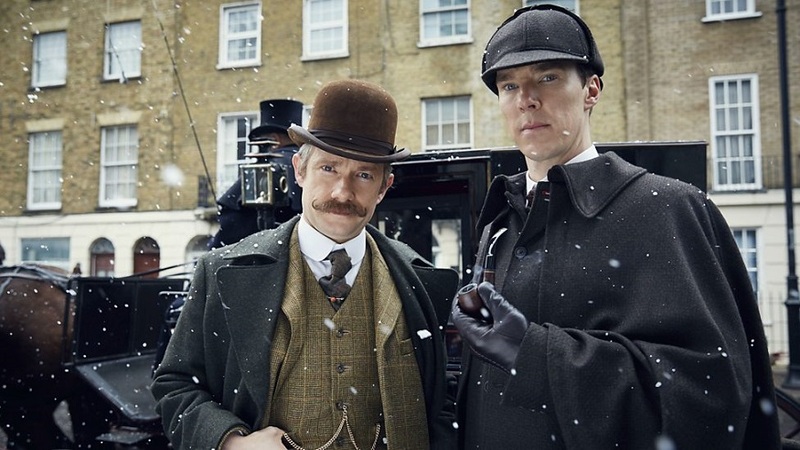 Martin Freeman as Watson and Benedict Cumberbatch as Holmes in the upcoming Victorian-set The Abominable Bride. Of course the latest TV series is not an entirely London affair either, with much of it filmed in Cardiff — although there are enough London locations to keep local Sherlockians more than happy. And what would Arthur Conan Doyle, the detective’s creator, have made of all of this? Well, Conan Doyle was no Londoner himself. His detective may have been described as knowing every alleyway of the great city, but Conan Doyle grew up in Edinburgh and lived in central London for less than a year before moving swiftly on to South Norwood. As for the hundreds of different re-imaginings of his most famous character down the years, we think he would have been quite relaxed about those too. When William Gillette was busy adapting Conan Doyle’s stage play, he cabled the author with the simple question "May I marry him?". To which Conan Doyle is said to have replied "You may marry, or murder, or do what you like with him". Subsequent writers have been only too happy to take him at his word. By Martin Davies, author of Mrs Hudson and the Spirits Curse, and Mrs Hudson and the Malabar Rose, published by Canelo. Benedict Cumberbatch and Martin Freeman return as Sherlock and Watson in The Abominable Bride on BBC1, 1 January 2016 at 9pm.